Night Vision Monoculars There are 21 products. Product Description At the core of the Challenger GS line are specially designed R-contact optics and Gen Super/CF-Super image intensifier tubes which provide edge-to-edge resolution performance unparalleled in a budget consumer night vision product. Product Description The Yukon NV 5x60 offers the highest magnification from any budget monocular unit in the current Yukon range. With focusable objective and ocular lenses for greater control, it is the large multi-coated 60mm objective lens which maximises light transmission to the premium Gen 1 image intensifier tube. Product Description The compact and lightweight NVMT Spartan 4x50 offers 4.0x image magnification and a 15° field of view. The Yukon NVMT (Night Vision Multi Task) Spartan range is the most ergonomically designed, aesthetically pleasing, well featured and highest performing Gen 1 night vision monocular series on the market today. Product Description The Cobra Optics Merlin EX™ offers a high grade Gen 1 image intensifier tube in a compact, lightweight and partially rubber armoured bodyshell. It has a revised eyepiece with extended eye relief and an extended rubber eyecup. Product Description The Cobra Optics Demon is identical to the Titan other than the size of the fitted image intensifier tubes. They’re both rugged and lightweight night vision monoculars. Product Description The Cobra Optics Titan is identical to the Demon other than the size of the fitted image intensifier tubes. They’re both rugged and lightweight night vision monoculars. 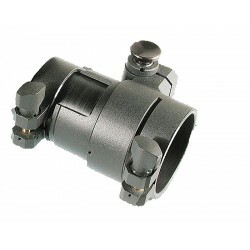 Product Description The DSA (Day Scope Adaptor) and HDSA (Hinged Day Scope Adaptor) adaptors allow various night vision monoculars to be fitted to the eye piece (rear) of most day telescopic sights.